The printing press has come a long way since Johannes Gutenberg ‘s invention of the first press with movable type in the mid-15th century. Today there are multiple types of printing presses designed for applying ink to everything from paper to metal. In commercial printing, substrates are the base material, supplied in sheets or rolls, onto which ink is applied. Traditional Offset printers were once limited to printing on paper. Today, paper is just the start of the numerous substrates available. Special ink formulations, UV printing technology, and improvements in the manufacture of substrates enables offset printers to apply ink to a wide range of plastics and synthetics. Paper stocks continue to represent the vast majority of print production output. Paper is separated into two categories, Coated and Uncoated. Coated papers have improved smoothness through the use of additives applied to one side or both sides of the sheet. Coated papers are classified by grade levels based upon the brightness. No. 5 is the least bright. Premium is the brightest. Most commercial offset printing utilizes coated papers graded No.1, No. 2, and No. 3. Text papers are available coated and uncoated in numerous textures, finishes, and colors. Text is used when accurate image reproduction is required and is the paper of preference for high quality print production. Book papers are less costly than text paper and available in more weights but fewer finishes. Book is an economical choice for large print runs. Cover papers are the heavier weight companion to text papers, available in coated and uncoated varieties with many of the same textures, finishes and colors. Index papers are inexpensive, bulky, and stiff. Index is not a good choice when quality reproduction of images is required. Bristol papers are similar to Index, but have a softer surface. Newsprint is very lightweight and comprised almost entirely from recycled fiber, used primarily to print newspaper publications. Onionskin paper is another very lightweight paper. It is sometimes also called Bible paper. This paper is used in special applications. Security paper incorporates features to prevent duplication, such as watermarks, colored thread, and metal strips. New security features are always in development. Carbonless copy paper has a microcapsule coating on the backside which offsets to the front of the next sheet when pressure is applied. Carbonless paper is used in business forms and bank checks. 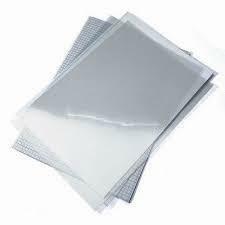 Metal-laminated paper is a metallised paper product with a layer of silver or gold aluminum foil adhered to one side. 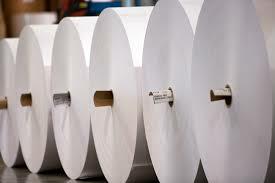 Synthetic paper combines the durability of plastic with the printing quality of paper. Synthetic paper stocks are water and tear resistant, and recyclable. These stocks will not become brittle or shrink and can withstand extreme heat and cold. Synthetic papers can be cut, scored, folded, stitched perforated and more on standard bindery equipment. There are two types of synthetic papers, those produced from a synthetic resin derived from petroleum, and those that combine regular paper with a plastic film made from high-density polyethylene (HDPE). To learn more about synthetic paper visit Yupo, a leading supplier of synthetic paper worldwide. Offset printing on plastic substrates is achieved with the use of UV inks and special chemicals on presses with UV drying capabilities. Plastic substrates cost substantially more than paper products. Polyethylene is a soft, flexible thermoplastic. It is the most common plastic and used extensively in packaging, especially plastic bags. Polypropylene is a versatile material available in clear, translucent, opaque, and various colors. PP is also available in a variety of surface finishes including matte, gloss, and textured. 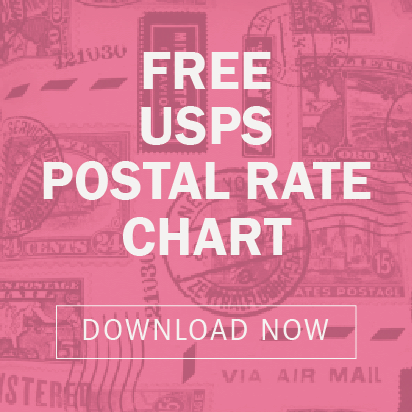 PP is used extensively for packaging, tags, folders, and promotional products. Polyester is durable and tear resistant plastic sheet suitable for both offset and digital printing when treated with a special coating which enables ink adhesion. Polystyrene is an economical plastic sheet that accepts ink well and works well in die-cutting applications but has a tendency to splinter when cutting. PVC, Polyvinyl chloride is printable in all UV and Digital printing processes, available in translucent, white, and colors with various levels of gloss. 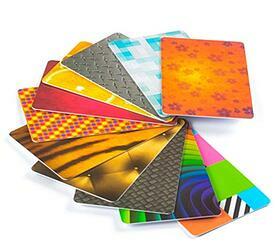 PVC is commonly used in plastic card printing. Vinyl is a soft plastic product available in gloss and matte finishes, used extensively in the production of stickers and labels. There are many options available and Creative Directors, Graphic Designers, and Print Buyers benefit from knowing which substrates will best achieve the intended results. Whenever unsure, call your printer's representative. They will be happy to discuss the best options available for your next project.